Pan American World Airways was the dominant international air carrier in the US from the 1930s until its ruin 1991. Its use of jumbo jets and computerized systems formed industry norms we know today. 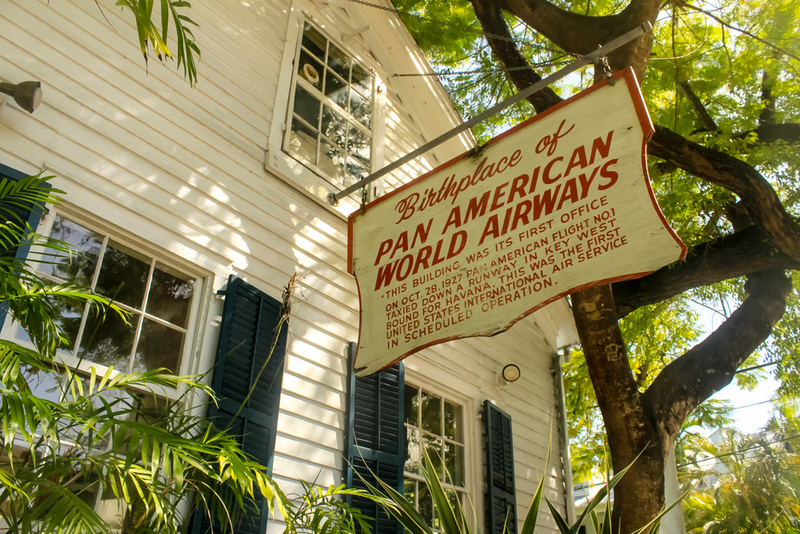 Surprisingly enough, Pan Am got its very humble start in one of the most unlikely of places: a small house off Whitehead Street in Old Town, Key West. For readers too young to remember Pan Am, it was a cultural icon of the Golden Age of Flying in the 1950s and ’60s. Its neatly-dressed stewardesses trained with the “Pan Am smile” were meticulously hired based on requirements that simply wouldn’t fly in the workplace today. Cocktail drinks flowed freely for passengers dressed to the nines, lobster dinners were served, smoking was permitted (if not encouraged), and economic flights certainly weren’t commonplace. But how did “The Blue Meatball” get its start in Key West? In the 1920s, civil aviation was on the rise, and different groups wanted to get in on the international flight market. Pan American Airways obtained a US Postal Service contract for mail delivery to Cuba – while only 90 miles away, the title of “international flight” meant prestige. Ironically enough, they lacked the aircraft to carry out the task. Fortunately, the small company aligned with two other aviation groups and was able to send a small flyboat from a carrier vessel in Key West to Havana, Cuba. The envelope of the trip is postmarked for Oct. 19, 1927. Pan Am later went on to offer frequent service to Havana for passengers who preferred the hour flight over an 8-hour boat trip. Pan American World Airways didn’t survive the times, but the quaint little house that sold Pan Am’s first tickets did. It’s still on the corner of Whitehead and Carolina streets in Old Town, now a restaurant aptly named First Flight. Offering housemade microbrews, a treetop terrace and garden dining, the local restaurant keeps up with the aviation theme. Make sure to check out its “crash bar,” which features a Sikorsky sea plane hanging from the ceiling.